Now through May 30th, audiences have the opportunity to see world history brought to life on the stage at Cincinnati Shakespeare Company as they present HENRY V, one of William Shakespeare’s history plays. Featuring a fierce Justin McCombs in yet another departure from the slapstick comedy he does so well, this show is anchored by a strong performance by him as Henry V as well as other solid work from the usual suspects – Jim Hopkins, Paul Riopelle, Jeremy Dubin, Caitlyn McWethy, Miranda McGee. Giles Davies is back; he’s a favorite of the CSC crowd and for good reason. Jon Kovach makes his Cincy Shakes debut. It’s a large cast and they make great use of Andrew Hungerford’s set as well as the aisle ways for a powerful scene featuring nearly the entire cast, weapons drawn, ready for battle. With cinematic lighting, dramatic sounds, and majestic staging Brian Isaac Phillips’s latest production will surely bring the masses to this classic theatre in downtown Cincinnati. We’re fortunate to have a theatre that embraces legendary plays, literature, and the bard with such gusto. 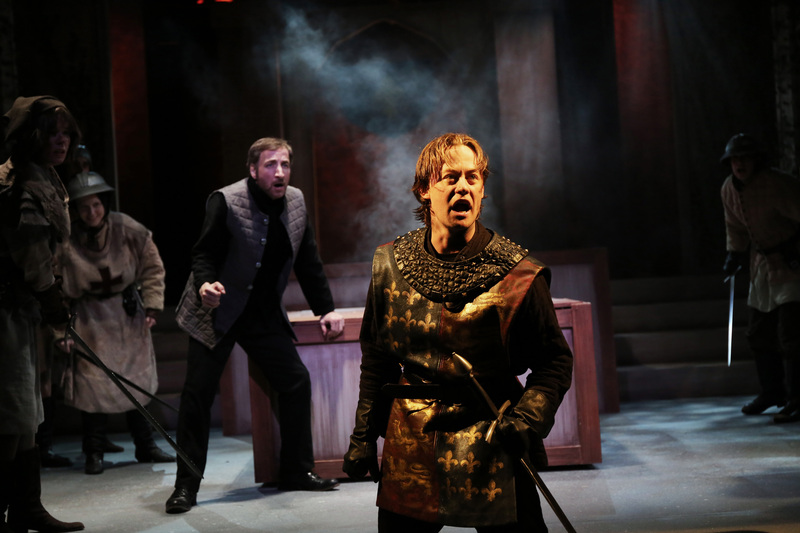 HENRY V runs through May 30th at Cincinnati Shakespeare Company. Click here for more information and tickets and to subscribe to next season, which features more Shakespeare like As You Like It, Julius Ceasar, Anthony and Cleopatra as well as Death of a Salesman, Cyrano de Bergerac, and Jane Austen’s Emma..